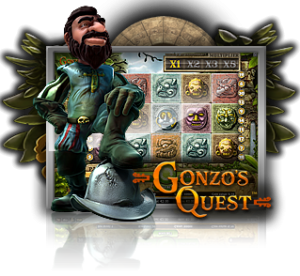 Gonzo's Quest: Slot Review - Classic Slot from NetEnt loaded with fun! Did you ever feel fascinated by the Spanish search for gold? The Spaniards were a nation of explorers, and they traveled all over the world in the quest for riches. Well, it’s no coincidence that remnants of the stories of the exploring Spaniards remain to this very day. Case in point – the slot game called Gonzo’s Quest. This is a slot game that’s developed by the slot game developer NetEnt. You may have heard about NetEnt as one of the greatest game developer when it comes to online casino games, and slot games in particular. As you may have realized from the introductory paragraph from above, Gonzo’s Quest is a game about the search for gold. And in particular, we follow the plight of the main hero Gonzo, who’s on a quest to find the lost city of gold, El Dorado. You can help him to do this if you play the game. The background of the game is set in a jungle, so you will see pleasant-looking imagery while you play the game. And the background sounds of the jungle will help you to feel like you’re right there at the scene, searching for the lost city alongside Gonzo. The symbols themselves are heads of creatures drawn into stones. As is the case with all other slot games, all you will need to do here is to press the spin button, and then hope that you will hit a winning combination. Of course, not everything is so simple – this game after all has certain features that separate it from the stiff competition. For one, the game features a fixed number of 20 pay lines. This means that you will have bigger chances of hitting a winning combination. On the flip side; it also means that you will have to spend more money for placing your initial bet. It’s a double-edged sword, so make sure that you handle it wisely. The symbols have their own assorted value – you can see this in the pay table that’s available in the game. And there’s also the wild symbol; which will replace any other symbol that you need in order to make a winning combination. This game is unique in the sense that it brings forward to the table the so-called avalanche feature. This means that the symbols won’t spin, but that they will instead fall into place, like an avalanche. And the best thing about that is that if you win a number of avalanches consecutively; you will get an increased win multiplier, of up to 5x. There’s also the free fall symbols which will turn a free fall mini game where you can get 10 free spins. This is a game that we recommend you to play, no matter who you are. It’s really fun, and it’s very exciting as well – and on the flip side it’s pretty simple to understand this game, no matter who you are.